When you want to send your thoughts of love and sympathy in a grande way, send this basket filled with fresh fruit, biscuits and tea. 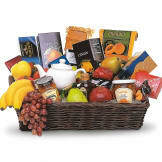 The Grande Gourmet Fruit Basket is a delicious and comforting way to show how much you care. • Fresh fruits, biscuits, chocolates and teas, along with a charming teapot, arrive in an impressive wicker tray. Great, plentiful fruit basket. Thank you for the timely delivery of the basket for the bereaved family's enjoyment.